Boulder Bluff, Inc, stock dog training vidios, shepherd whistles, and training collars. "The Stockman's Best Friend" is a movie made for the sole purpose of helping any one who is looking for the correct methods and tools to train their dog to be a good working and obedient dog. I demonstrate how I teach basic obedience and all the different stages of how to train the dog to work livestock. We have found in our thirty years of training dogs that the training collar, used in the correct manner, can be the fastest most effective way to correct a dog. The training collar is not a quick fix for anyone to use in the place of experience and knowledge. I have not trained a single dog who has not been smart enough to know when he has the advantage over his handler. This video teaches you how to gain the advantage and take control of your dog. In the video there are several dogs turned loose at the same time and you will see that I have total control of all of them. 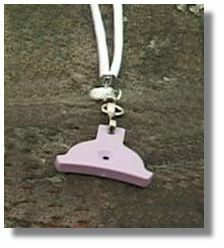 We manufacture a variable pitch whistle, also called a Shepherds Whistle. We have found it to be a very effective tool to use to communicate with your dog. Our Break-Away lanyards safely pull apart under pressure and can easily be put back together. We have made a Cassette Tape and CD with several different whistle and word sounds for you to learn and practice with. We have a wide selection of training collars for you to choose from that have proven to stand the test of time and training. The Commands Page has an article that everyone should read about what we think you should know about how dogs learn. We are still training dogs. When we have a trained dog available we will post information about the dog. We are here to serve our customers with the very best products and advice on how to train a dog to be a good working dog or family pet. You can place your order by Phone/Fax 479 651-4772. If you prefer to E-Mail your order, the address is listed at the bottom of the page. We appreciate all of our customers and respect their privacy.